For those who want to carry their stuff around in style while they get outdoorsy, Status Trailers unveiled this classy and sporty Leisure Trailer. Although it’s a lifestyley trailer and they focused on design, but there’s no compromise on practicality either. It can take care of you with camping, bulky luggage, bicycles, diving, fishing, games kit, winter and water sports equipment and many other uses. The trailer has two spacious compartments with top opening hatches, allowing for easy access and loading of equipment, with a volume capacity of nearly 2,000 Litres (2 cubic metres) and a load capacity of around 500kg. Wet and dry equipment can be easily separated and the rear compartment has a hatchback style door to enable easy loading from the back. Much to the delight of off-road enthusiasts, Jeep and Mopar revealed the first ever camper trailers which have off-road capability. Jeep Trail and Extreme Trail campers are designed to cope with the Wrangler model’s rugged go-anywhere characteristic, and therefore they have the same design cues, including Jeep Wrangler Rubicon 17-inch cast-aluminum wheels. These campers are available in normal and extreme versions which differ in height and ground clearance. Avaialble in four colors, Trial models have a MSRP of $9,995, while the Extreme runs for $11,995. Unlike conventional recreational campers, the Jeep Trail Edition camper features an extensive use of lightweight tubular-aluminum construction (no wood or fiberboard materials) in order to mitigate the additional load on the Jeep tow vehicle and make operation a breeze. This also helps to keep the weight down thus making them easier to tow behind the car. Volvo has always been a pioneer in developing business truck, and they are one of, if not the, best names in this field. So when they are talking about the future, they’re really onto something! This futuristic truck you see here is their vision for 2020. Apart from the fancy design, this truck is also dripping with technology with the main focus on the driver. They want to make the job easier for the driver by autopilot, driven non-stop in nose-to-tail convoys on green super-motorways linking the continents. As road transport expands it must also become safer and more efficient. Volvo’s design concept contains ideas about how that can be achieved. Some of these ideas can be integrated into production today, while others are there to arouse interest and start a discussion. One of the more startling ideas is to link vehicles together wirelessly into long road-trains that rush across the continents at 90 km/h (56 mph). There are many advantages. Road safety increases, transport services require less space and wear and tear on the roads decreases. Fuel consumption and CO2 emissions drop thanks to reduced drag when a truck is in the slipstream of the vehicle in front. In addition the driver can rest behind the wheel while the truck effectively drives itself. If this is counted as idle time, transport times can be cut, deliveries will be made more quickly and drivers can get back to their friends and families earlier. The driver is at the center of Volvo’s world. It goes without saying that a design concept from Volvo Trucks contains a great many ideas about the development of the driver environment. In the Volvo Concept Truck 2020 the driver’s environment is spacious, airy and free of disruption. Another space-saving idea is the sleek driver’s seat with its thin, ventilated mesh backrest, more like a modern office chair than a traditional driver’s seat. Behind the driver is a futon sofa which folds out into a wide, comfortable bed in the evening. The lighting in the cab is divided into zones customised for the driver’s various in-cab tasks, or for resting. Around the driver are large areas of glass providing good visibility out of the vehicle and even into it. This benefits eye contact between the driver and other road users preventing accidents. Privacy screening and blackout in the evening are also controlled electronically. The design team also aimed for a sleek look for the exterior, reducing the perception of the vehicle’s size. The LED headlamps and indicators are integrated into the front of the vehicle. The rear-view mirrors have been replaced by cameras that project their images onto the inside of the windscreen. The lower section of the front of the vehicle features integrated collision protection projecting forwards about half a metre. This ‘nose’ is gentler on oncoming cars in the event of a head-on collision and has also been shown to improve the aerodynamics of the vehicle. Some things you just do not change. The ‘Globetrotter’ sign on the roof is still there, but has been redesigned so that it harmonises with the lines of the vehicle and reduces drag. The driver can also change the text on the sign from the instrument panel. So work on the external design focuses largely on aerodynamics, but by how much is it really possible to reduce drag on a truck ? If you are looking for a 4×4, but have a limited budget, not to worry. Today, you don’t have to buy a big bulky 4×4 that will break the bank. There are plenty of vehicles available that are incredibly affordable and offer plenty of practicality and functionality. If you are looking to purchase an SUV, here are some tips. The Sante Fe has been around for a few years and over this time it has converted many to the Hyundai brand name. With decent warranties and a price tag that is right, you and your family can be travelling in style. The Kia Sorrento offers 4 wheel drive, plenty of room and a price tag under $25K. Also, this SUV has been earning plenty of positive reviews. And as the quality of this vehicle maker continues to climb, the Kia Sorrento looks more and more like a great deal and value. 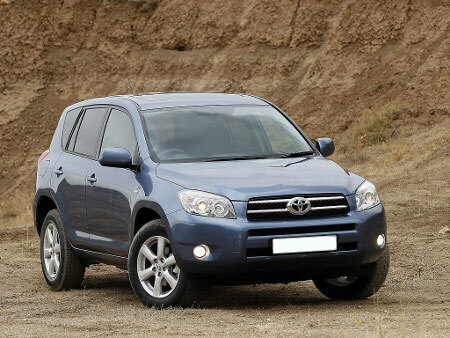 The Toyota RAV 4 (see post image for details) has been a favourite of plenty of 4×4 enthusiasts. For those that need a smaller size SUV with plenty of punch, the RAV 4 is definitely a great choice. The RAV 4 is reliable, offers plenty of features and plenty of value. The RAV 4 can be had for about $22K with decent features. If you are looking for lots of space to carry your family, your toys or plenty of functionality and have a small budget, check out the above vehicles for 4×4’s that offer plenty of value.